Every day we have so much to be grateful for alhumdulillah. But there is no denying that some days are harder than most, and then there are days that truly test your imaan! During the past ten years, I’ve had many of those days and I have met a few people who were, to put it nicely, “challenging”. As the world gets more hectic and becomes more advanced, people are rushing around, far too busy for their own good. At times, it seems that this busyness is a ticket for some people to be inconsiderate, obnoxious, and even toxic. I’m sure you've noticed that there is higher lack of concern, compassion, and empathy for one other’s plight as we scramble around trying to keep up with our own problems. However, as Muslims, it is not only our obligatory duties that determine our strength of faith but our etiquette of how we treat others. If you are feeling this way then you are not alone. It's sad to say, but many Muslims are not behaving the way they should nowadays - aiming for the character traits like the the Prophet SAW. You'll find people who talk in circles, thinking that being vague makes them noncommittal and less likely to hurt another's feelings. They hide behind excuses and false sweetness thinking they are being nice when their fakeness is blatant and more hurtful to the other person. Some people struggle with the mere act of being punctual by failing to think of the other person who is waiting for them. Their time is more important than your time, and it seems that the person with the better manners gets the short end of the stick. What about the sisters who treat one another with deceit, being envious, backbiting and slandering another sister only moments after enjoying a chat, a meal, and some laughter together. No remorse is felt because of the misconception that “I have a right to say what's on my mind” and “that’s just how I feel” trains of thought. "Would the Prophet SAW say it this way?" "Would the Prophet SAW do it this way?" If we thought of everything in this manner, most times we would need to refrain from what we were going to say or do. We know how the Prophet SAW handled his affairs and more importantly, how he treated people. He was compassionate, kind, honest, trustworthy, and never insulting - even to the worst of people. He gave others the benefit of the doubt and was the greatest man who ever lived. He SAW had the best of manners! Every one of us can improve something about ourselves. We can learn to do more things fi’sabilillah - wanting to do something purely for the sake of Allah SWT without measure or gain. We can work more on being humble by knowing that all knowledge, intelligence, and worldliness we've attained, is not from ourselves but from Allah’s Blessings. We can work on becoming more empathetic, compassionate, patient, and helpful towards one another. “The [true] Muslim is one from whose tongue and hand other Muslims are safe.” - Bukhari and Muslim. 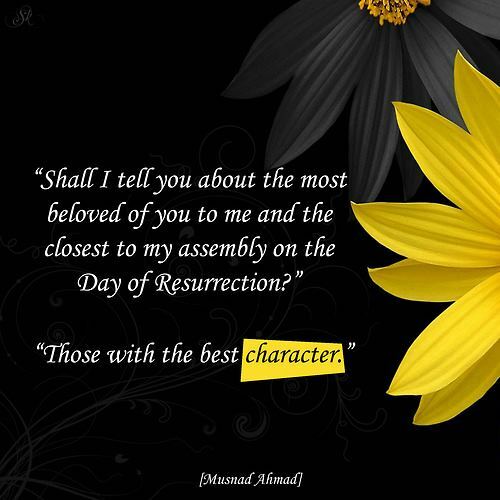 "The (faithful) slaves of the Beneficent are they who walk upon the earth modestly, and when the foolish ones address them answer: Peace.” - The Holy Quran"
We should teach our children how to be better Muslims with adhab and character traits like the Prophet SAW, and educate them about his manners and the way he dealt with people. If we look at his example, we will see that he never showed enmity to anyone except those who waged war against his people. There was an old lady who used to throw rubbish in his way on the street everyday. On one occasion she was missing, so he decided to go and see what was the matter with her. She was ill in bed and to her amazement, the Messenger SAW came to see her and find out about her health. She accepted Islam from seeing his character. On another occasion, the chief Thumamah, who had killed many Muslims, was caught on his travels by Muslim soldiers, taken to the Prophet’s SAW masjid, and tied to one of the pillars. The Messenger of Allah commanded his companions to untie him and give him the best food. The Prophet SAW was indeed a mercy to the worlds. Allah loves us to have hearts that are ready to forgive. Similarly, the Prophet SAW said that the best of people are those who are slow to anger and quick to forgive. On the other hand, the worst of people are those who are quick to anger and slow to forgive. The characteristic that makes a person most likely to forgive is the purity of their heart. We may believe that to forgive easily is a sign of weakness and humiliation, but honor in the eyes of Allah lies in forgiveness. May we all be guided to the siratul mustaqueem and be auliya to one another, ameen.